In West Lisbon, we cover the riverside route between Alcântara and Belém (the westernmost point of the city), a fascinating walk. 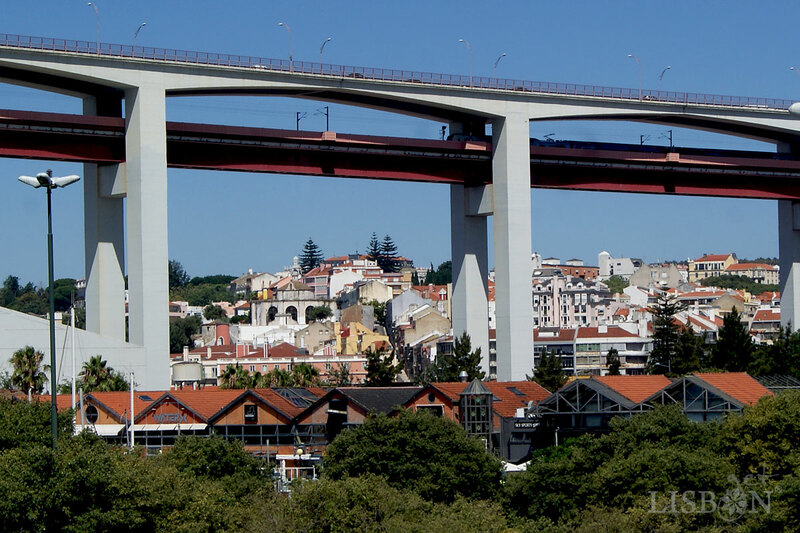 We will also make some close inland inroads, such as Alto de Santo Amaro and Ajuda, where we will discover gardens, palaces and breathtaking views of the Tagus River. This territory belonged to the king and was throughout the time divided into parcels and attributed to nobles. It is therefore marked by old palaces in different states of conservation and some, unfortunately, only present in old engravings or documents that prove their existence. 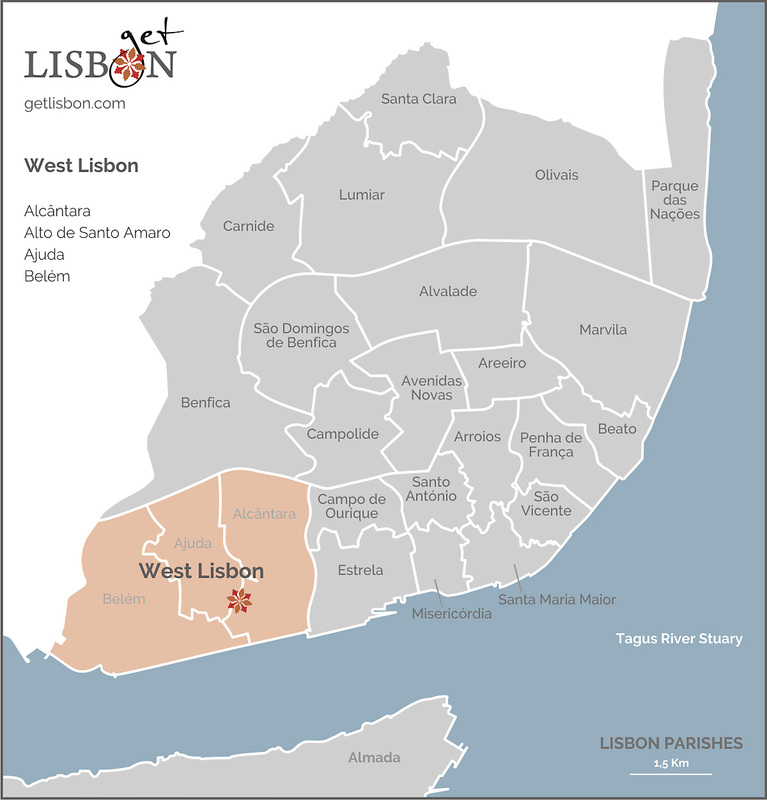 West Lisbon was a fertile zone of vineyards and orchards, animated not only by the agricultural activity but also by the existence of lioz (a rare type of limestone that exists in the region of Lisbon and its surroundings) quarries and limekilns. Alcântara from Arabic al-qantara means bridge. A bridge that already existed in the Roman period, but it was the Arab occupation that gave it its name. It connected the two banks of the stream that flowed where Avenida de Ceuta is today. In 1755 occurred a terrible earthquake, and despite an existing real palace collapsed, we can say that the area of Alcântara was not particularly affected by the destruction. It even became an attractive place for those who had to flee from other regions. The king himself had a new palace built at the top of Ajuda and for a long time, he lived there in a wooden house constructed for this purpose, the Real Barraca (the royal hut). From the 18th century onwards, the industrial development promoted by Marquês de Pombal (minister of King D. José) has here one of the manufacturing centres. This event would last until the 20th century, attracting people from different regions of the country who found work in dyeing, metallurgy, or in the activities of the port of Lisbon. We can observe this industrial environment in the presence of the cast-iron architecture and in old social services installations such as bathhouses, lactários (milk dispensary) and vilas operárias (a neighbourhood attributed to workers), that supported a population of poor and famine workers. With the changing of times, the factory activity was disappearing, and the factories and the warehouses of the active port of Lisbon were being emptied. They are now occupied by restaurants, bars, and nightclubs that liven up the city’s nightlife. From the renewed industrial environment in the beginning of the 20th century, we pass to the starting point of the Descobrimentos (Portuguese Discoveries) in the 15th century, Belém. This is the must-see place for anyone who visits the city. Here are the most magnificent and significant monuments of Lisbon. And why not say, of the country? The Torre de Belém, the Mosteiro dos Jerónimos… and the famous pastéis de Belém (Belém egg custard tart), that have been there for centuries delighting us. But you already know all of this. What you may not know is what the Chão Salgado (salty ground) means or what Travessa da Ermida is about. Are you curious? That’s what we want! Anonymous on After all, Are they Pastéis de Belém or Pastéis de Nata?